We are in the first month of the annual special 2-month Fundraising Campaign – Has your church started fundraising? Churches are invited to support this special Church Fund Raising Campaign March 15th – May 15th, 2019. Each church is encouraged to target raising a minimum of $1,000. Funds are used to shore up the Society’s capital fund, one focus is to help with expenses when staff travel to preach, teach & work nationally and globally. The church raising most funds takes the award. One suggestion is the Give Thermometer Graphic Idea – one way to give members of your church an understanding of the goal and motivate them to get it done. Last year’s award winner, First Hopkinton SDB, had committed to a budgeted giving on faith that God would provide what they committed to giving to missions, and has won this award for the past two years. We look forward to hearing about your fundraising activities over the next few weeks. WHO WILL TAKE HOME THIS YEAR’S TROPHY? 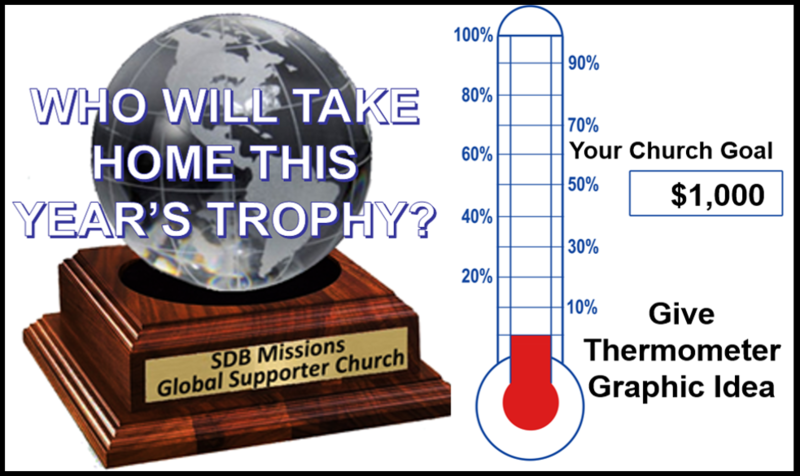 Your SDB congregation only has about five weeks (until May 15th, 2019) to participate in this fundraising campaign.